Well, he’s not a client of agent Jeff Schwartz, at least not according to this updated list of Schwartz clients, which includes recent addition DeAndre Jordan and still includes Jason Kidd. The Bucks coach has made roster moves to acquire Schwartz clients before (Michael Carter-Williams, Tyler Ennis, Rashad Vaughn, Mirza Teletovic), so one couldn’t help but wonder whether Schwartz was behind the Bucks signing of Marshall Plumlee to a two-way contract earlier this week. But there appears to be no Schwartz connection this time. And the Plumlee signing doesn’t seem to have much to do with Andrew Bogut and the will-they or won’t-they talk about adding the onetime Buck All-Pro center to the roster for the stretch run and the playoffs (assuming no catastrophic collapse). The rumor mill is churning but neither the Bucks nor Bogut have said anything to indicate his return to Milwaukee is a real possibility. This is, after all, Marshall Plumlee the Bucks just signed, not Tyson Chandler, which the Knicks highlights below from last season prove inconclusively. The look on Phil Jackson‘s face after Plumlee hits that old school Dave DeBusschere style 18-foot set shot says it all. There’s no denying Marshall Plumlee looks just like a Plumlee. At first glance, the Bucks signing of Plumlee #3, did seem to suggest that Kidd wasn’t too interested in Bogut; or that Bogues didn’t think a move to Milwaukee in the dead of winter to play for Kidd and his big men coach Greg Foster (with help from notorious Bogut antagonist Kevin Garnett as consultant), was such a bright idea. But timing isn’t everything. Jan. 15, the day the Bucks signed Plumlee, was the last day teams could sign players to two-way contracts, a new arrangement this season where a player can play up to 45 days in the NBA (one-fourth of the season) at a pro-rated NBA minimum salary ($1.3 million in Plumlee’s case) and the rest of his time in the G-league. (Source: Article II, Section 11 (f) of NBA Collective Bargaining Agreement, “Two-way Contracts”, pp: 49-56). With half the season gone, the most Plumlee can earn in NBA salary is $328,000, but whatever he makes it will not count toward Team Salary (pg. 192 of the CBA). Two-way players are not included in the roster while they are with a G-league team and are not eligible for the playoffs unless their deal is converted to a regular NBA contract. The Bucks have not converted any of this season’s two-way players (Gary Payton III, Joel Bolomboy, Xavier Munford). No team salary hit, no roster spot, no playoff eligibility — hardly the stuff of great meaning in the context of Andrew Bogut and the Bucks, who need all the help they can get in the middle. This much was painfully obvious Jan. 5 when Raptors center Jonas Valanciunas humbled the Bucks big men with 20 points and 9 rebounds in the 3rd quarter as the Raptors blew the Bucks out of their own building. The destruction was ruthless and complete. Bucks centers John Henson and Thon Maker responded with 0 points, one rebound and 5 fouls in the quarter. In a fit of perfect timing, the Lakers waived Bogut the very next day. It’s not inconceivable that the Lakers brass caught the overnight Bucks-Raptors highlights and thought they might as well do the Bucks and Bogut a favor by releasing AB to play out his swan song with the team that drafted him. Yet no one has confirmed since then that the Bucks are actually interested, only that the Bucks had “thoroughly discussed the pros and cons of signing Bogut.” This came from a routinely unreliable Bucks beat writer down in Racine who quoted no sources for the record and could not get official comment from the office of Bucks GM Jon Horst, who’s not exactly unavailable to media. The Bucks should want Bogues back, if only to entertain the fans before he leaves the NBA for good, which will happen in the near future. Bogut was the Bucks No. 1 overall draft pick in 2005, the heart and soul of the “Fear the Deer” team in 2010, the Bucks only All-Pro in 12 seasons 2005 to 2016, and the founder of the fan section that still rocks the Bradley Center. There’s almost too much symmetry given the Bucks screaming need for HELP in the paint. The Bucks defense has been among the worst in the league this season, 25th entering last night’s (Jan. 17) Miami game. Western Conference fans and media may not know it, but in the East, dinosaur centers yet walk the earth. The Heat’s Hassan Whiteside has become a more recent opposing-center-dominates-our-guys problem. Whiteside had a strong game (15 pts, 10 rebs, 4 blocks) against the Bucks Jan. 14 in a blowout win by the Heat, and was downright dominant in the rematch in Milwaukee a few says later (Jan. 17), won by the Heat 106-101. Defensively, he blocked six shots, grabbed 12 rebounds and kept Giannis Antetokounmpo and guards Malcolm Brogdon and Eric Bledsoe out of the lane (the Bucks starting guards shot a combined 4 for 20 from the field, while Giannis was 6 for 15). Offensively, Whiteside scored 27 pts while his backup, Kelly Olynyk, added 15 — 42 combined points, all too much for the Bucks on a night when Bledsoe was even more chaotic than usual. Miami has won 8 out 9 games and moved up to 4th in the East, which means they’re another possible playoff match-up for the Bucks, and the Bucks have two more Heat games on the regular season schedule. 42 points from the center spot is almost unheard of in today’s NBA. The last time it happened was Nov. 15 when the Sixers Joel Embiid dropped a career high 46 on the Lakers. Bogut played 20 minutes in that game and actually slowed Embiid down, blocking his shot once and grabbing 10 rebounds to help the Lakers take the lead after 3 quarters. Embiid poured in 19 pts in the 4th, most of them (14) after Bogut checked out of the game with 7 mins to play. When he was on the court, the battle between the young star and the aging defender was real enough, and both players delivered in a wildly entertaining game. Lakers coach Luke Walton benched starter Brook Lopez in the second half. Embiid ruled the day, but Bogut had proven he wasn’t finished yet in the NBA. The Bucks have yet to see Embiid and the Sixers this season (4 games coming up); and while there’s only one game left on the schedule against Boston, the Bucks might see the Celtics and centers Al Horford and Aron Baynes, who gave Henson and Maker trouble early this season, in the playoffs. Kareem Abdul Jabbar was in attendance for the Heat game as part of the Bucks ongoing 50th Anniversary celebration, and, right on cue, he talked about the Bucks lack of “inside defense”. The centers may be “dinosaurs” in the new NBA, yet you need them to beat the teams that feature good big men. This makes no sense, but the basketball universe is howling now for Jason Kidd and Jon Horst to make a move, which signing Plumlee is not. As for Bogut, there’s no news but speculation, even so far as a suggestion in the Daily Telegraph of Australia that one option is for him to return home and work for the Sidney Kings, the Aussie pro team he supported as a kid. Bogut negotiated to play for Sidney during the NBA lockout 2011-12 but those plans fell apart over insurance issues, the Daily Telegraph reports. Bogut would probably prefer to return to the Warriors to relive a championship run but, barring injuries to the Warriors versatile crew of big men, he may no longer be a good fit. The Warriors don’t have the problems the Bucks, Cavs or other potential Bogut suitors have. Realistically, it’s probably too soon to expect a move for Bogut, whose destination may not be decided until after the trading deadline Feb. 8 or All-Star break Feb. 16-18. The last day to sign playoff eligible players off the waiver wire is March 1. The Bucks have just finished their toughest stretch of the season — 13 games in 23 days, of which the Bucks lost 8, won 5 and fell to 7th in the East with a 23-21 record. If the playoffs began today, the Bucks would get a rematch of last year’s 6-game series against the Raptors. But there’s no reason to panic yet — a much softer schedule lies ahead in the 13 games between now and the All-Star break Feb. 16. In case of fire, call Bogut. This entry was posted in The Jinx and tagged Andrew Bogut, Basketball Australia, Boston Celtics, Golden State Warriors, Hassan Whiteside, Jason Kidd, Joel Embiid, Jonas Valanciunas, Marshall Plumlee, Miami Heat, Milwaukee Bucks, Philadelphia 76ers, Sidney Kings, Toronto Raptors on January 18, 2018 by J.D. Mo. Maybe they can’t help it: Bucks Olympic disappointments… Luke VIDEO time! Milwaukee Bucks players, when given an opportunity, will disappoint. They’ve done it for a few years now, to the point where it’s become enough of a habit to pass into “axiom” stage. Changes in uniform, team, environment, venue and competition could not prevent our Bucks from disappointing in Beijing, almost as if the effects of the 2007-08 season were lingering like a bad hangover. How deep does this thing go? One of those players, Yi Jianlian, is no longer a Buck, yet even a trade with New Jersey couldn’t stop our 2007 draft pick from disappointing. He had a terrible opener against Team USA; the proud debut for the host team. There was Yi on NBC live, going scoreless in the first half, eventually being yanked from the game in the 2nd quarter after an unsportsmanlike foul. Yi did come out in the second half after the game was over and score nine points in garbage time, but that didn’t stop ESPN’s Chris Sheridan from devoting an entire column to Yi’s lousy play. Sheridan was brutal. Yi did have his moment: A key 18-foot jumper against Germany that helped send China into the quarterfinals. But he was a noshow in China’s quarterfinal loss to Lithuania. The rookie wall, it seems, is made of granite. Disappointing. Bucks center Andrew Bogut had the best Olympics of any Buck, but that ought to tell you how deeply ingrained in the Bucks this disappointment factor is. Bogut’s Olympics was an ordeal — marred by injury and a start in which he shot only three times as Australia looked like a rec league team unsure whether or not they were in the right gym. The Aussie coach fumbled about for a couple of games and finally found his rotation in game four to salvage the Australia tournament — but in Australia’s biggest game in eight years against Team Redeem in quarterfinals, Bogut found foul trouble, more playing time problems and a second ankle injury. Bogut did defy the Bucks jinx and dominate against Russia and Lithuania to lead Australia to the Team USA matchup – which had to make you wonder what was going on with the Autralian team. The Australian professional league is dying from lack of interest. This national team was the last hurrah for a few veteran NBL players. The coach, Brian Goorjian has been a long time NBL coach. We may never know what was going on with the team — but did you know that in six games Bogut played less than half the available minutes? He averaged 19.7 mins per game. Out of 40. Unbelievable. Disappointing..
Michael Redd? Can Bucks fans remember back on this: When was the last time Michael Redd was not disappointing? Were there a couple of games last year in which he led the Bucks to victory? He did beat Cleveland with a buzzer beater in February. That much I recall. It was his first walk-off gamewinner ever. Perhaps it was last summer when the USA Senior Men’s team qualified for the Olympics by winning the Pan An games. Redd scored 14 pts a game in that tournament. Or maybe earlier this summer when the USA basketball cancelled its tryouts and Redd officially made the team. When the team got to Beijing, however, Redd’s role on the team eventually whittled down to nothing. It wasn’t supposed to be this way. Redd was intended to be the team’s designated three-point specialist, the gunner brought on to rain highlight film jump shots to bust teams out of zone defenses. Redd began the Olympics generally receiving stints in the second quarter and the fourth. His first run, however, came up empty. He entered the game and instantly began looking for his offense, drawing a foul, missing a shot, missing another one. Coach Mike Krzyzewski pulled him from the game after 2 mins, 42 seconds. Later on in the 4th quarter it was almost sad watching Redd and Yi trade baskets after the game was decided. Sad and futile and familiar. Redd would finish the game with nine points on 3-9 shooting, three garbage time three pointers, one with 29 seconds left. Redd would hit seven more shots over the next five games, but miss 15 and close his Olympics 10-31 from the field, 5-18 on three-pointers (27.7% rate from behind a line more than three feet closer to the hoop than the NBA’s). Bogut, believe it or not, tied Redd with five three-pointers for the Olympics, making 5/8. Who knew he could shoot from 21 feet? * Redd played 12 minutes in the second half, scoring 4 pts on 2-4 shooting (0-1 from downtown). He did not play in the first half, but didn’t try to force any offense during his stint in the 2nd. With all the frenetic defense and fast-paced transition the Redeem Teamers play, they haven’t had much of a role for him. These things won’t be written about in Bucks country as the gold medals are polished in the sports pages. Why ruin a golden moment when Redd’s the Milwaukee connection to the Redeem Team? But when is Michael Redd going to be part of delivering winning moments on a basketball court? One key play is not a lot to ask, is it? Something, anything for Bucks fan to get excited about would do. Disappointing. Realgm.com’s fine Bucks forum moderator, PaulPressey25 made a great observation on opening day of Olympic basketball play. After spending Sunday morning watching Redd, Bogut and Yi, he wondered whether their struggles stemmed from playing last season in the losing environment of the Bucks or whether the source of the problem is that, as players, they really aren’t all that good. I’m sure many Bucks fans who saw those games had similar thoughts. The grace period on delivering excitement this coming season may be very short for the 2008-09 Milwaukee Bucks. Well that sure was a downer, wasn’t it? But it had to be done. I will say that, having followed Bogut and the Australia Olympic team through the Olympics, things were not as they seemed in the Aussie camp. In the end, Basketball Australia got what they needed out of the Olympics — they made the medal round and found their way to a high profile matchup with the Redeem Team. Bogut went from looking like an almost substandard center in Game 1 to all-world in Game 4 vs. Russia. Very strange stuff. Perhaps the Aussies were just to too much of a team still in transition toward its next generation to have it be any other way. I do hope the Bucks are working to get the clearest possible picture on the medical treatment Bogut received on his ankle (s) during the games. Remember this guy? That’s Patty Mills, the Aussie guard who dazzled (and turned 20) during the games. He’ll be back at St. Mary’s (Calif.) college this fall, playing Loyola Marymount, Pepperdine, Gonzaga et al. in the West Coast Conference (WCC). Definitely a player to watch in the NCAA this season and a hot topic all over the college and draft boards after Beijing. In fact, he’s already been mock-drafted #14 in 2009 at Draft-Express.com! The draft junkies may may get the DTs over it, but why don’t we play some basketball first before we have another draft? Mills was one of a quite a few players who opened a few scouting windows during the Olympics, and some of them may be worth taking a look at, even in an immediate or short term context with the Bucks … hypothetically. But there’ll be time for that in a later post. Now, in the interest of ending this post on a positive, upbeat note, here’s some more fun Luke Ridnour video. This entry was posted in International & Olymp. and tagged 2008 Olympics, Andrew Bogut, Basketball Australia, Led Zeppelin, Luke Ridnour, Michael Redd, Patty Mills, Yi Jianlian on August 27, 2008 by J.D. Mo. Continuing doggedly on my mission to spark some interest in Olympic basketball while the Brewers go yard for the playoffs and the Packers embark into the post-Favre era, take a look at what Milwaukee Bucks center Andrew Bogut was doing Friday night halfway around the world in Beijing, China. That fiercely emphatic dunk on Andrei Vorontsevich were points 10 and 11 of a 14-7 Australia Boomer run to begin the 4th quarter of a do-or-die medal round qualifying game against 2007 Eurobasket champs Russia, hammering the Aussies home to an 80-62 lead. The.Australia run effectively buried Russia, though forward Viktor Khryapa (Chicago Bulls) made it interesting with a barrage of three-pointers after the Aussies had pushed the lead to 21. The final was a convincing 95-80, with Bogut throwing in a three-pointer with 30 seconds left to spite the equally chippy Russians. Bogut finished with 22 pts, 8 rebs. Aussie point guard C.J. Bruton scorched the nets for 22 of his own and handed out 6 asts. Their reward? The Group A #4 seed and a an almost certain quarterfinal matchup against Team USA, which on Saturday made perhaps the strongest statement USA basketball has uttered since the Jordan-Magic-Bird Dream Team — a 119-82 blowout of 2006 world champion Spain. Team Redeem clinched the Group B #1 seed and meets the Boomers Wednesday. (Standings and latest scores). Both teams played meaningless 5th games, with Australia waltzing Sunday night 106-75 over injury-conscious Group A top seed Lithuania and Team USA this morning destroying Dirk Nowitzki and Germany 106-57. Until Friday night, the 23-year-old Bucks center’s Olympics had been disappointing and frustrating. As Australia crumbled against Croatia and Argentina, Bogut scarcely resembled the aggressive post player Bucks fans saw most of last season. Worse still was that he wasn’t playing very much and was the focus of debate about the team’s failures. Aussie coach Brian Goorjian rose to make an impassioned defense of Bogut Thursday but along the way revealed that he, as coach, was de-emphasizing his star player — on purpose. The coach apparently believed that some of the lesser Aussie players would be responsible for delivering wins and Australia’s first-ever basketball medal. In the Russia postgame, Goorjian again told reporters that he still didn’t think the team should rely on Bogut to carry them. The coach is in obvious denial about his team. (I’d love to hear an opinion from Yao Ming’s China coach about Goorjian’s attitude toward his center). Against Russia, however, Goorjian finally did what basketball coaches do: he played his best players and finally seemed to settle on a rotation, riding Bogut and the timely shooting of Bruton to victory. Bogut logged 28 minutes and was strong from start to finish (including a “we mean business” unsportsmanlike foul on Utah Jazz/Russia star Andrei Kirilenko to open the 2nd half). Less than 48 hours after the coach had said Bogut could not be expected to carry the team, Bogut carried the team. That’s what star players do. Unfortunately for Australia, Goorjian spent the first three games of the Olympics foolishly trying to prove otherwise. For more about Goorjian’s curious handling of Bogut in Beijiing, I made live game notes during the Australia-Russia game and have moved those to the bottom of this, the BBJ mothership weekend Olympics post. Team USA 119, Spain 82 Boxscore. What to say about Team Redeem that hasn’t already been said? The Team USA defense is the dominant force in this Olympic basketball tournament. Pau Gasol (Lakers), Jose Calderon (Raptors) and their world champion Spanish team were no match. Lebron James and Dwyane Wade seem to have found a higher gear of intensity that may not have existed until now. The two stars are playing with what looks like controlled fury. I don’t think either one of them cracked a grin the entire first half, as they again led the team. *Jason Kidd shocked the world by taking and making a shot, joking after the game that he had ruined his Olympics. “My man gave me the ball and I had to take the layup – even though I didn’t want to,” Kidd said. The shot came at the 6:56 mark of the 3rd Quarter with Lebron James leading a fast break. Kidd dutifully filled the left lane just like in practice drills and Lebron found him with a pass too close to the basket for Kidd to do anythng but plant his right foot and go up for the left-handed layin — which, by the way, was textbook. Obviously feeling sheepish after the game, he snuck out of the arena like Mike Tyson the night Buster Douglas knocked him out. *After hitting nothing but rim the first three games, Denver’s Carmelo Anthony found his jumpshot, scoring 16 pts on 6-8 shooting, 4 of 6 from behind the arc. Anthony and the Pistons’ Tayshaun Prince (Pistons) were partly responsible for the extra gaudy margin of victory, shooting a combined 7/10 from downtown, while the rest of the team shot a merely human 5/15. Bucks guard Michael Redd missed his lone three-point attempt. * Team Redeem stole the ball 16 times, led by Chris Paul‘s 5 steals (also 14 pts). Spain turned the ball over a whopping 28 times, a rate of one turnover every 85.7 seconds. * Lebron James led with 8 asts (and 18pts). Lebron leads the Olympics in assists through 4 games with 22 (5.5 avg). * Pau Gasol played 33 minutes but was held check, with just 13 points on 5-8 shooting. His 7-foot-tall, 270-lb brother Marc played some solid stretches, with 8 pts, 3 rebs in 18 mins before fouling out. Marc Gasol has a good-looking mid-range shot and mixed it up against the US, getting to the line six times. Looks like the Grizzlies have a player. Yi hits crucial final minute shot, China advances 59-55 over Germany: Much like his former teammate, Bogut, Nets forward Yi Jianlian rose from goat to hero status in his fourth Beijing game, swishing an 18-footer with 28 seconds to go to put China up 58-55. Yi wasn’t done. He then sealed the win on the defensive end, harassing Mavs All-Pro Dirk Nowitzki into a missed three and a turnover. Yi finished with 9 pts, 11 rbs in his best game of the Olympics while also guarding Nowitzki most of the night. Dirk scored 24 and hauled down 17 rebs, but shot only 7-20 from the field, capping the night with that horrific final 28 seconds. Somewhere in New Jersey, a GM is breathing a little easier. Australia 106, Lithuania 75 – With Lithuania undefeated and Croatia securing the #3 seed with a blowout of Group A patsy Iran earlier Sunday night, this game was meaningless. Australia started quickly with Bogut scoring 9 points in the first 2:20 seconds and only briefly looked back – when Bogut went to the bench for seven minutes in the first half. That stretch was the last time Lithuania pulled to within single digits. Bogut led all scorers with 23 pts on 10-12 shooting in just 16 mins. The Aussie D forced 25 turnovers, a good workout with Team USA next. The boxscore and game lines say Bogut shot 3-3 from 3-point land, but there must be some mistake. A criticism of Bogut in the NBA is that the midrange jumper he had in college has disappeared, but what’s this? Was it a long-range jumper all along? With 3 threes last night and 2 against Russia, he now has more 3-pointers in Beijing than Michael Redd, Team Redeem’s three-point specialist. Perhaps Bogut’s trying to send a message to Scott Skiles? The message is probably for Aussie coach Goorjian. “Keep me in the game” would be appropriate. USA 106, Germany 57 – Team Redeem jumped out to a 20-3 lead and the rout was on. Carmelo Anthony opened the scoring with a jumper, which isn’t so unusual, but when Jason Kidd hit a three-pointer and Dwight Howard made a free throw in the early minutes, Germany should have packed it in and headed for the Olympic Village. Proving that, yes, Orlando Magic center Howard has been somewhat bored against the likes of Greece and Angola, Team Redeem’s only center woke up against Germany’s NBA big men Dirk Nowitzki and LA Clippers center Chris Kaman. Howard led all scorers with 22 pts, 10 rebs and 5 missed free throws. Kaman answered with 6 pts and 4 rebs in 17 mins, hardly worth the special German work visa that has allowed him to play for his great grandparents deutschland in the Olympics. … Kaman committed 3 turnovers in less than a minute spanning the end of the 1st quarter, first few ticks of the 2nd quarter – which is difficult to do. This is one of the reasons, 2006 playoffs also among them, that Kaman did not make the Bob Boozer Jinx Top Ten (or 13) NBA Centers’ List. Lebron and Kobe were a combined 7-10 from 3-point land, which should probably be against the rules of fair play. The rest of the team shot just 4-16 on threes, including 0-4 from Michael Redd. On the game, Redd played nearly 13 minutes, mostly in the second half, and shot 1-9 from the floor, finishing with 2 pts, 1 reb, 1 steal and 1 turnover. … Germany has a 6′ 9″, 247-lb forward named Sven Schultze who looks precisely like Sven Schultze. We have our answer r.e. the hubris of the Aussie coach Brian Goorjian. He’s apparently come to his senses (maybe Goorjian read the Bob Boozer jinx today). Bogut dominated Russia in the first half, starting and finishing strong, scoring 12 points and grabbing four rebounds. The Aussies lead at half, 49-33. They’ve led throughout, pushing it to 16 on some hot shooting by David Anderson at the end of the 1st quarter, early 2nd. Bogut was on the bench during that run, but returned when Russia cut it to 11. Five straight points in the post by Bogut extended the lead back to 14, and he muscled in the final two points of the half for a 16 point lead. Bogut played 15 mins in the half. Unless there’s foul trouble, Bogut should get one break per 20 minute half, and clock at minimum 32 minutes a game. I’d play him 35. Bogut’s the one advantage the Aussies have over most teams in these Olympics – every team except China and Team USA. He should be on the court 80% of the time. It was asinine for Goorjian to try to prove otherwise or play it any other way. Bogut’s 4/5 from the line, which would be a nice trend. He’s a 59% free throw shooter in the NBA, as bad as Dwight Howard. Russian center Aleksei Savraskeno had a good first half, and so did the Bulls’ Viktor Khryapa. Khrypa’s got 9 pts, 4 rebs at half; Savrasenko 12 pts, 10 in the first quarter until Australia fed Bogut and forced the 7′ 1″ center to the bench with fouls. Other than the big men, the Russians are having problems. The point guard from Pittsburgh, John-Robert Holden (a guy with a pretty interesting story) shoots a lot but he’s not hitting. Neither is.Kirilenko. The speedsert Patty Mills isn’t playing well for Aus but the other point guard, CJ Bruton is. He’s hit a couple of threes and has 8. Forwards David Anderson and Matt Nielson are also playing well. I don’t understand why the Aussies stick with center Chris Antsey. He’s a veteran, age 33, an Aussie basketball league MVP, etc. But he does next to nothing on the court … Bogut, Anderson and Nielson are all 6′ 11″ plus. Maybe this is at the heart of the Aus problem. It’s time NOW to transition to the younger guys, not in two years. Whether Goorjian wants to admit it or not, the games are here, and they count. Having your opponents drill home the need for transition in the middle of the Olympic games has looked awful and pathetic …and confused the players about their roles. Antsey’s only played five minutes this game, probably 2 too many. He’s backing up Bogut. Bogut starts the half by hammering Kirilenko – “unsportsmanlike” foul. Good idea to keep Kirilenko from getting his game together. This sets off a 9-0 run by Russia, though, cutting the lead to seven points before Nielson finally scores to stop it. Bogut then pushes the lead back to ten with, believe it or not, a three-pointer!! What is he doing out there? He’s 1-2 from behind the arc for the game. Ugly play – Khryapa blocks Bogut’s shot about five minutes in. Bruton hits a three. He’s got 11 now. Anderson’s got 11 but he’s in foul trouble (again) with three. So is Nielson (again). We’re at the point in the game where the refs may give the Russians a shot at getting back in the game. Bogut has Savrasenko in foul trouble. 61-48 – Bogut goes to the bench six minutes into the quarter, replaced by Antsey. Too short a run for Bogut. Antsey turns the ball over. Rus center Savrasenko comes in to try and take advantage of Bogut’s absence. Russians can’t hit – Holden’s missed two threes and turned it over twice. …Antsey hits a three as I was writing about him. … 65-49 ..
69-55. Holden and Kirilenko have hardly rested at all. The Australia D has been very good for the first time in the Olympics, and Holden and Kirilenko are shooting terribly, accounting for Australia’s big lead. Bogut and CJ Bruton back in to start the quarter. Bruton opens with a three to push the lead to 17 – 72-55. Bruton has four threes in the game. Bogut had a quiet 3rd (just the three pointer) but the Aussies are going back to him now in the 4th. He missed his first two shots but hit the third.. Bruton misses, Bogut grabs the offensive board – Mills hits.. 78-62. Kirilenko goes to the bench, leaving Holden, Khryapa and Savrasenko. Australia’s playing their best lineup: Bogut, Bruton, Mills, Newley and Nielson … Russia can’t score. THE DUNK: Bogut wheels in from the arc and throws down an Olympic sized jam over the defender (Vorontsevich again). And the foul! He’s got 19. 80-62 … What a statement! Russia gets Kirilenko back in the game w/ two others. Savrasenko’s out. Bogut misses the free throw. Next Aussie possession, Sergei Montya hacks Bruton – an unsportsmanlike, followed by a scrap with Nielson retaliating. Bogut steps into it too. The Russians are losing it. Bruton makes the free throws – 82-62. Three minutes into the quarter and the Aussies have outscored Russia 13-7. This is probably the game. Bogut to the bench, Antsey in. Huh? It’s not over yet. The game’s getting chippy, but wouldn’t that be reason to leave him in? Aussies aren’t supposed to duck a potential broken nose. Maybe his arm’s numb from the dunk? Khryapa hasn’t been a factor in the second half. He’s rebounding, but he hasn’t hit a bucket. Russia finally gets a hoop with 4 minutes left to make it 83-64. 14-7 for the Aussies in the first six mins of the 4th. Inside out game with Bogut, Bruton and Mills. Until that last hoop, nearly a three minute scorelss drought for the Russians – it killed them. Holden hits a three w/ 2:40 left, cutting it to 12. Bogut’s still on the bench. Russians are on a 9-0 run. Goorjian puts Bogut back in after a Mills turnover. Khryapa hits a three. Then another. It’s too late. Bruton and Nielson are hitting their free throws. Should be game barring some craziness. Rus could always employ the hack-a-bogut defense here. .. BOGUT JUST HIT A THREE for the helluvit, as if the dunk wasn’t enough … Bruton sews it up with two free throws – he and Bogut finish with 22. FINAL: Australia 95, Russia 80. Boxscore. Bogut finishes with 22 pts, 8 rebs, 2 asts in 28 mins. Bruton also had 22 (4-8 on threes) and 6 asts. Viktor Khryapa led Russia with 21 pts, 9 rebs, on the strength of his three-pointer barrage in the last four mins of the game. Kirilenko was held to 6 pts on 1-10 shooting. Holden from Pittsburgh had 20 pts but shot 20 times to get it. Savrasenko had 16 in 19 mins but was invisible in the 2nd half due to foul trouble. I’d call that a win for Bogut (and Antsey), who neutralized the Russian big man. Bogut’s 28 mins were easily the most he’s played in Beijing. That’s still not enough PT in a 40 minute game, especially with full two-minute rests at the quarters (NBA breaks are 90 secs.) Realistically, if he’s given breathers around those breaks, Bogut should play 32-33 minutes or more in a contested game. In this game, Bogut sat for 1/3 of the game until he reentered in the 4th after Khyrapa started hitting threes. Goorjian never should have taken him out of the game in the 4th. Is the coach obligated to find minutes for Antsey? All that talk from Goorjian before the game about Bogut being “the future” of Aussie basketball, about other players defining the team’s success … I think Goorjian finally had little choice but to acknowledge that Bogut is the present of Australia basketball and that the Aussies needed to win a game NOW or go home. The team needed a big game out of Bogut and he delivered. It was the first time a big game had been asked of him, which probably explains why the Aussies are looking at a quarterfinal game against Team USA instead of Spain or Greece. A difficult Olympics for Bogut: Goorjian seemed to use Bogut’s ankle injury (he rolled it July 31 against Angola) as an excuse to deemphasize Australia’s celebrity, $72-million-dollar contract, NBA “star” — who joined training late — and then try to make the unrealistic statemet that the team should be bigger than its best player. The Australia Boomers aren’t like the 2007-08 Bucks where it became very debatable as the season wore on who the best player was. Bogut is the man for Australia, and the reality is that Australia was only going as far as Bogut could take them. Perhaps Goorjian threw in the towel against Croatia and Argentina. Or maybe it was simply about playing Chris Antsey. Whatever the case, and it was probably a combination of all three, the coach foolishly rejected his star player until it was too late to salvage Australia’s medal hopes. That’s Russia’s Maria Stepanova boxing out Australia’s Lauren Jackson. Australia won the game. Apparently, things got rough out there …. This entry was posted in International & Olymp. and tagged 2008 Olympics, Andrew Bogut, Basketball Australia, Jason Kidd, Lauren Jackson, Michael Redd, Yi Jianlian on August 17, 2008 by J.D. Mo. Aussie fans have watched their men’s basketball team flounder in the Beijing Olympics, and have resorted to bashing their star, Andrew Bogut. The Bucks center is, after all, the only NBA player on the team, and the only #1 overall pick of an NBA draft. He should have done something to prevent those embarassing losses to Croatia and Argentina, right? What a bum! He’s going soft playing in the pampered American millionaires league. And why isn’t “the 72-million-dollar man” playing more than 17 minutes in a game? “Yao Ming cannot carry China on his back. What Bogut does in my environment has been my decision and how Bogut is used and was used today has been my decision. If it doesn’t go well, I think you should look at the coach because if the country is not happy with the way Andrew Bogut is playing, I’ve gone along the same game plan since I’ve had the team. Did the coach just call Bogut “boy”? If you don’t quite understand Goorjian’s logic, that’s OK. What do you say about a coach who changes nothing when his country’s best player — a bonafide NBA center no less — joins the team? Much of what Goorjian said isn’t even true, which may go a long way toward explaining why the Aussies are effectively facing elimination. Yao Ming, for one, is in fact attempting to carry China on his back. That’s the job of a team’s best player. When Argentina struggled earlier this week, who did the team look to? – Manu Ginobili, who put the team on his back and set Argentina back on track. * vs Croatia (lost 97-82): 21 minutes; 10 points; 1 rebound; 2 assists; 4 turnovers. * vs Argentina (lost 85-68): 24 minutes; 7 points; 4 rebounds; 2 assists; 2 turnovers. * vs Iran (won 106-68): 17 minutes; 10 points; 7 rebounds; no assists; 1 turnover. Goorjian, if the coach can be believed, has admittedly not allowed Bogut to be himself. Can you imagine Yao Ming (who says he’s playing at only 60-70% full strength) sitting on the bench while his team played like drunken bar leaguers, falling behind by 20? No. But that’s what Goorjian did with Bogut in the Olympic opener vs. Croatia. Bogut didn’t start the 2nd half!!! Barring another broken nose in the first minute, can Milwaukee Bucks fans imagine a circumstance in which Bogut would grab ONE REBOUND in a game? Somehow, coach Goorjian found it against Croatia. “The boy” Bogut’s been on the team a month now (not a week, coach) and has accepted the subordinate role Goorjian has given him … and watched his teammates crumble. He hasn’t done much to help, but then it’s difficult to rebound a basketball from the bench, which is where Goorjian apparently prefers to keep his star center. When Bogut did play against Croatia, he looked tentative, at times lost on the court, an innocent bystander watching as his teammates went through the motions trying to find shots and playing pathetic D. It was strange to see, because on the Bucks, Bogut often acts like a coach on the floor, barking out directions, doing his best to lead. He also plays 35 minutes per game in Milwaukee. The truth is, Goorjian hasn’t stuck to a game plan at all, as he claims. There is no set Aussie rotation; player minutes fluctuate wildly; and Goorjian has changed point guards. Patty Mills, the 20-year-old quicksilver guard who wowed Team USA Aug. 5, is now getting the bulk of minutes over C.J. Bruton, after playing only 18 off the bench vs. Croatia. Ingles and Barlow, two of the guys whom the coach claims “success is based on,” played just 13 and 14 minutes against Iran. No wonder Australia doesn’t look like a team — the coach doesn’t seem to have a clear idea what his team is. Goorjian’s right about one thing: “If it doesn’t go well you should look at the coach.” The Aussies could use a new coach. Even Bogut’s first NBA coach, Terry Stotts, would be a major improvement. The Aussies are now 1-2 and tied with Russia for 4th place in Group A. The teams square off later tonight (Friday) with the loser likely out of the tournament when group play finishes Monday. The winner should advance to the quarterfinals and a matchup against Team USA (or Spain should the Gasol brothers and Jose Calderon pull off an upset against Team Redeem Saturday). The Russians, led by Jazz forward Andrei Kirilenko, have struggled with losses to Croatia and Lithuania, the top teams in Group A so far along with Argentina. The Russians have been working their injured power forward, Bulls bench player Viktor Khryapa into the rotation. 7′ 1″ Alexei Savrasenko is the center. This is must win for both teams and a good center matchup for Bogut. But will Goorjian play Bogut or leave him sit half the game? Broadcast info: Australia vs. Russia, 10:15PM-midnight CST, online. Brewhoop’s Alex Boeder has been keeping tabs on the Olympic dream, which is nice for us blogger types consumed by the Mo trade. (It occurs to me that the trade should be known as “the Luke trade” in the same way the Yi trade is usually refered to as “the Jefferson trade” or “RJ trade.” I’ll wait for the corporate memo.) Boeder reports that Dwyane Wade continues to be the best player of the Olympics averaging 18.3 pts per game. There there’s the U.S. defense, which Boeder says stifle any international stereotypes about lazy American defense. The Redeem Team defense has been by far the most dominant factor in the Olympic basketball tournament. The U.S. clamped down on Greece 91-69 Thursday, with Kobe Bryant and Chris Bosh leading the way with 18. D-Wade added 17 and six steals. Greece beat Team USA in 2004 in Athens and came into Beijing with high medal hopes. The Greeks have come down to earth, as Spain handled them easily, too, in the Olympic opener. Team Redeem meets world champion Spain Saturday in its toughest matchup to date and the marquee game of group play. Spain brings brothers Pau Gasol (Lakers all-star) and Marc Gasol (Grizzlies), Jose Calderon (the Raptors point guard who made T.J. Ford expendable) and Juan Navarro, who played with Memphis last year but is headed back to the Euroleague. Also onboard is wunderkind kid guard Ricky Rubio, who looks and supposedly plays like a mini Pistol Pete Maravich (the Pistol was 6′ 5″). Team USA has shot poorly from the outside, so this could get interesting. Michael Redd ranks 10th on the team in minutes played, at about 11 per game, Boeder reports. To me Redd hasn’t looked comfortable playing a spot role. Coach Mike Krzyzewksi usually gives Redd his first run in the 2nd quarter and Redd has apparently decided that he needs to get his offense going right away or he’ll be back on the bench. The effect is the opposite. Redd has forced the action, firing up threes and looking for his drive …. with mixed results until he’s quickly pulled back to the bench. Sadly, this has looked familiar to Bucks fans, except for the benching part. Redd struggles mightily with the “let the game come to you” concept. NBC will carry USA vs. Spain live Saturday morning at 9am CST. Tip-off is at 9:15. Hoopshype has a clean Olympic “leaders” page with boxscores and schedule. The FIBA site, the NBC site and a few other main hubs, like Interbasket (a Eurobasket site) have a kind of placid Microsoft sheen that I find sort of repulsive. I don’t particularly like being reminded that the Olympics is a Nike and McDonald’s thing, much less Microsoft’s plans to dominate first my laptop then the world. Australia’s David Anderson is is now a teammate of Bucks forward Ersan Ilyasova’s on AXA FC Barcelona. A roving big forward on Australia, Anderson has played center for CSKA Moscow since 2004, winning two Euroleague championships and leading the Euroleague in 3-point shooting % last season (54.2%). Hoopshype describes him as “one of the best centers left in Europe.” FC Barcelona signed free agent Anderson to a three-year deal in June. This entry was posted in International & Olymp. and tagged 2008 Olympics, Andrew Bogut, Basketball Australia, David Anderson, Ersan Ilyasova, Michael Redd on August 15, 2008 by J.D. Mo. Olympic basketball kicks off this weekend, the men’s tournament Sunday morning, Aug. 10. The USA “Redeem Team” and Michael Redd begin Group B play against Yao Ming, Yi Jianlian and China. Andrew Bogut and his Australia Boomers open against Croatia in Group A.
Here’s the game schedule. Click here for NBC’s broadcast schedule. NBC will have a few of the US games live, including Sunday’s opener, but you know how NBC is, jumping in and out of the action. If it’s not on the toob (NBC or USA Network), it can be viewed live online, a great opportunity for American hoops fans to see for ourselves how the rest of the world is doing. It’s creative loafing time. Team USA with Kobe and Lebron is a heavy favorite to bring the gold home after finishing 3rd in Athens 2004, no matter how cynical the press row has been. But let’s not get cocky. This is arguably the strongest field in Olympic basketball history. Spain, Greece, Argentina, Russia and Lithuania are expected to be in the medal running. Watch out for Bogut and Australia, and Germany. Croatia’s a sleeper. China, Iran and Angola are the also-rans. That’s the conventional media wisdom, which might be half right. (Count how many times you hear an announcer apply the “arguably best player in the world not in the NBA” tag to different players.) I haven’t seen most of these teams play yet, so prognostications will have to wait. Instead, let’s examine the weirdness that is international basketball with a trusty ten-point Olympic primer. 1) The time shift will take some getting used to: Beijing is on the other side of the world, 13 hours ahead of Milwaukee. Group play begins at 9AM [I’ve corrected this] each morning in China, seen live in Milwaukee at 8PM and continues through the night until about 11AM the next morning — six men’s or women’s games daily Aug. 9-18. All of the U.S. men’s games, however, are prime time and night cap games in China, which means 7AM and 9:15AM tip-offs here for Team Redeem (can we come up with a better nickname?). Hoops with early ayem coffee instead of beer, plenty of time to get caught up with work in the afternoon. Here’s NBC’s basketball broadcast schedule again, online games included. Bogut’s first game Sunday 7AM vs. Croatia can be viewed online. USA-China tips off Sunday at 9:15AM, live on NBC. 2) The Olympic tournament features 12 teams divided into two groups of six, A and B. After a five-game round-robin within the groups, four teams from each advance to the quarter finals Aug. 20, where the stakes are do or die, one game elimination. The team finishing 1st in its group plays the 4th place team from the other group; the 2nd place team plays the 3rd place team from the other group and so on. For example, If Australia and Bogut finish 4th in Group A, the Aussies would likely play Group B U.S. in the quarterfinals and be sent Down Under without a medal — although it would be a good game if the refs let the rough stuff go, which they won’t (see #10). The semifinals are Aug. 22, the medal games cap the Olympics Sunday, Aug. 24. GROUP A: Argentina (full line-up of NBA experience led by the Suprs All-NBA guard Manu Ginobili, and forwards Luis Scola of the Rockets and the Bulls’ Andres Nocioni), Australia (Bogut), Russia (Jazz forward Andrei Kirilenko), Lithuania (no Cavs center Zydrunas Ilgauskas this time), Croatia and Iran. GROUP B: Spain (Lakers all-star Pau Gasol and brother Marc of the Grizzlies; shooting guard Juan Carlos Navarro, Wizards draftee), Germany (Mavs All-NBAer Dirk Nowitzki, Clippers center Chris Kaman), Greece (a few guys who didn’t stick in the NBA), China (Yao and Yi), Angola and Team USA. 3) No matter how much it appears to be smaller, the international (FIBA) ball is, in fact, the same size as the NBA ball (size 7, 22 inches diameter). It is not, however, the same ball. The NBA ball – “the one ball” – is a Spalding. The international ball can be made by any manufacturer that pays the licensing fees and certifies the rigorously zany process that the offical FIBA ball must undergo, including refrigeration and other laboratory processes, and a goofy paint job. 4) The international three-point line looks to be about the same as the college three-point line but is 9.1 inches further out at 20′ 6.1″ (6.25 meters) from the hoop. The NBA arc is three feet-plus further out (23′ 9″ – except at the baseline where the line tapers to 22 feet). There was really no excuse for the U.S. shooting 3-18 behind the arc the other day in its tuneup game against the Aussies — though the reason may be that NBA players don’t shoot as well as players a generation ago. In 2010, FIBA will move its arc back about a foot-and-a-half. Apparently, the rest of the world still thinks the NBA three line is too far away from the hole. 5) The lane, that trapezoidal lane, wider near the hoop. It looks just as weird as it always has, and there’s no good reason for it. What’s the purpose? To keep big men away from the basket and make post play more difficult, of course, and to equalize height advantage. That’s not a good reason. I’ve also suspected the trapezoid was designed “just to be different” from the American game, less squarish and not unlike the goofy paint job on the ball. But not for long. The trapezoids will be peeled off the world’s hardwood in 2010 as FIBA has come to its senses and will paint the standard American lane, which you already know if you hit the link in #3. 6) Zone defense is allowed, anything goes, no defensive three seconds for guarding no one. A team can clog the lane all it wants on D, which gets back to the questions in #4 about the trapezoidal weirdness. The zones will impact Team Redeem. NBA players are used to clear-out, one-on-one basketball and post offense against man-to-man D, and generally run two root plays — pick-and-roll and give-and-go. The off-the-ball cuts that free shooters against zones are not ingrained in their offensive styles, and Lebron and Kobe never played a second of college ball where zones are allowed. Neither did center Dwight Howard. If anything is the premium in international ball, it’s zone-beating outside shooting. Many teams (Spain, Argentina, Lithuania, Greece) are stacked with great shooters, while Team USA came to China with one fewer than it probably should have. The Olympics would be a bad time for Michael Redd to start forcing offense and fall into one of his bad streaks, those slumps that for the Milwaukee Bucks have often come at the worst possible times. 7) The court is 2′ 2″ shorter and nearly a foot narrower at an even 28 meters by 15 meters, something that only the great, idiosyncratic shooters of the era, Ray Allen and Reggie Miller, probably ever paid any attention to. The three point line is already much shorter, so trimming five inches left and right along the baseline is negligible for most players. I do foresee Redd finding his heels on the out-of-bounds line a time or two if he’s running the baseline and setting up for corner threes. 8) Forty minute games just like in college, 5 fouls to foul out. Unlike college, however, there are four periods, with a two-minute break at the end of the first and third quarters (the NBA break is only 90 seconds). Much like the trapezoidal lane, there seems no good reason that this should be different from both the NBA and NCAA, other than being different for the sake of being different. This one, though, heavily favors NBA stars used to playing a grueling 36-40 minutes a game. Imagine the never-tiring Lebron James, Kobe Bryant and Chris Paul. 9) Fewer timeouts. In the NBA, teams get six plus a 20-second timeout. In FIBA ball, it’s one time out per period until the 4th quarter, when teams get two — five altogether plus the longer quarter breaks. No 20-second timeout. This shouldn’t matter, right? Watch various Redeem Team players try to save possession by calling 20-second timeouts when falling out of bounds or scrambling for the ball. Ahh, it’s the little things in life, good for shits and giggles. Also note that many international refs seem to have a man-crush on Argentina’s shooting guard, a phenomenon heretofore known as “the Manu Ginobili factor” (Manoo factor for short). Links: A comprehensive preview of Team USA from Inside Hoops. From a Russian basketball junkie, a “general questions about international ball” page at ballineurope.com. Here’s the rules comparison sheet again from USA basketball. An official FIBA preview. Dirk Nowitzki (Germany), Manu Ginobili (Argentina), Andrei Kirilenko (Russia), Sarunas Jasikevicius (Lithuania) and Yao Ming for host China were the flagbearers for their countriesin the opening ceremony — a pretty good indication of how important Olympic basketball is around the world. Heavy gravitas for the basketball stars in Beijing. Draft Express.com has some conventional power rankings that should be read with skepticism. Celtics blogger Green Bandwagon has better insight. Chris Sheridan’s China archive at ESPN is an excellent resource. NBA.com is also on the beat. I’ll be keeping track of Aussie basketball and Bogut here and here. You won’t have to look hard for the Lauren Jackson photos on those Aussie sites. Here are those broadcast listings from NBC, one more time. This entry was posted in International & Olymp. and tagged 2008 Olympics, Andrew Bogut, Basketball Australia, Kobe Bryant, Lebron James, Manu Ginobili, Michael Redd, Yi Jianlian on August 7, 2008 by J.D. Mo. Down Unders give Team USA reality check… Why Bogut didn’t play… Lauren Jackson! If ever there was an air of invincibility surrounding Lebron James and Kobe Bryant’s Team USA, the Australia Boomers hacked it away Tuesday in Shanghai, China, in the final pre-Olympic “friendly” game for both teams. Despite a notable lack of energy and poor shooting games from Kobe, Carmelo Anthony and the Bucks’ Michael Redd, the U.S. held on to win 87-76. Redd played only eight minutes, scored two points and missed all three of his three point attempts. Australia played without Bucks center Andrew Bogut, nursing a rolled ankle, but the Aussies roared out of the second half with a 13-2 run and refused to go away until the final minutes. I know, I know, I wrote in my last post that Bogut was almost certain to play. I seem to have fallen prey to the old American attitude about Olympic basketball — I just don’t take it as seriously as the rest of the world does. I see it as a fun tournament, a celebration of basketball worldwide played by teams that wouldn’t beat the Boston Celtics. It only matters if or when the U.S. loses. Then the fun stops. Tuesday’s game could well have been the only time the U.S. and Australia meet in China (they’re in different groups and Australia is not a medal favorite). So I also figured the Bucks center wouldn’t let a minor injury keep him out of a matchup against All-NBA Orlando Magic center Dwight Howard, who’s outplayed Bogut nearly every time they’ve faced each other. Reporter: Any doubt he’ll play against Croatia? Reporter: Was Goorjian worried that it would flare up during the game? Would Bogut have helped the Aussies against the USA? Somewhat. He would have been tangled up in the paint with Howard, and the trapezoidal lane of international ball doesn’t help either player offensively. But Bogut’s presence might have freed other players for Australia and forced US Coach Mike Krzyzewski to play less smallball. As it was, Lebron got minutes at center against Australia 7-footers Chris Antsey and Anderson, and 6′ 11″ forward Nielson. Toronto forward Chris Bosh spent three-fourths of the game on the bench. Utah’s Carlos Boozer didn’t play at all. The game was rough and foul-marred, with the teams missing a combined 20 free throws and Kobe and Antsey squaring off in the second quarter — typical stiffarm Australian stuff. The Aussies turned the ball over 18 times but Team USA countered by misfiring jumpers all game long, shooting just 3-18 from behind the arc against Australia’s sagging man-to-man defense. Steals and transition made the difference, as Dwyane Wade led all scorers with 22 points. Lebron had an interesting line: 16 pts, 4 assists and 5 steals in 33 minutes. From the Australia perspective, the whistles blew on them far too often again — a trend that international refs will probably continue into the Olympics — and they turned the ball over too much, especially in the first half as the U.S. took a 15-point lead into halftime. But the positives far outweighed the negatives: the Aussie shooters shot well, point guard Patty Mills’ quickness off the bench surprised the U.S. guards, and five players scored in double figures, led by Mills and Antsey with 13. Their best player didn’t play, yet they shocked Team USA to start the second half and made it a game. If the Aussies were a sleeper pick for a medal before the game, they may have lost that status. USA women top Australia Opals 71-67: On the women’s side, the USA-Australia dynamic is a bit more intense. They’re the hands-down favorites for a third straight Olympic gold medal matchup, with the edge to the US. It’s the usual star WNBA suspects, some of the best female players ever. Lauren Jackson for the Aussies and Lisa Leslie, Candace Parker and Sue Bird for the U.S. The warmup game yesterday in Haining, China, was a scrapfest until it ended, with Aussie point guard Penny Taylor, another WNBA star, finishing with a black eye on her way to leading all scorers with 19. Leslie led the way for the US with 13. Definitely a heated rivalry to keep an eye on in these games, if for no other reason than Lauren Jackson. Yes, the Australian mag cover’s four years old, and it is truly a shame that the photo spread inside cannot be posted here. This entry was posted in International & Olymp. and tagged 2008 Olympics, Andrew Bogut, Basketball Australia, Kobe Bryant, Michael Redd, Team USA on August 6, 2008 by J.D. Mo. A minor ankle injury Andrew Bogut suffered last week benched the Aussie center in the second half Friday against Argentina, but he’s sure to play in the Aussie’s next Olympic warm-up Tuesday ayem in Shanghai against Team USA. Contrary to a report on JSOnline yesterday suggesting that the Bucks center was injured in the Argentina game, Bogut tweaked the ankle during his 32-point, 11 reb rampage against Angola Thursday. Aussie basketball reported that Bogut carried the ankle injury into the Argentina game. Bogut started and played most of the first half against Argentina but missed most of the second half. With Bogut on the court, the Aussie Boomers built a double digit lead up to 19 early in the 3rd Quarter. Without Bogut in the paint, Argentina big forward Luis Scola (Houston Rockets) went off for 28 second half points as the Aussies couldn’t close, losing 95-91. Is it possible Bogut could sit out Tuesday’s game against the U.S.? Slightly, but he’s almost certain to play. It is much more possible that Australia and Team USA could never meet in these Olympics (Australia is in Group A, the US is in Group B). The way the Olympic tournament is set up, if the Aussies finish 1st or 3rd in group play, the Boomers would not play the US unless they made the gold medal game (assuming Lebron and Kobe et al win Group B) or if Team USA loses one along the way. The Aussies would be the surprise of the tournament if they did that well, though I think they’re becoming a great sleeper pick for at least a bronze medal. But that’s looking too far ahead. Tuesday’s game for Bogut is a matchup in the paint against the Orlando Magic’s 1st team All-NBA center Dwight Howard and a chance to play against his Bucks teammate, Michael Redd. Bogut’s a guy that doesn’t like to sit out Bucks games even when his nose has been mashed, much less a test against Howard that he’d run to on one leg. The ankle injury is minor. He’s playing Tuesday. Game time Tuesday is 7AM Central Time. ESPN2 has the game live from Shanghai, China. (Shanghai’s 13 hours ahead of Milwaukee). For an internet feed go here to myp2p.eu. You’ll probably need to download the p2p software to make it happen. This is the last tune-up game for both teams – Olympic basketball starts this Sunday, Aug. 10. Team USA opens Group B play against China; the Aussies in Group A go against Croatia. USA defense, Kobe, stop Russia 89-68: Lebron fouled out with just ten points but Kobe Bryant was relentless on D and on the O, leading all scorers with 19 in what ESPN’s Chris Sheridan described as “a defensive struggle.” (Sheridan’s again got the Olympic basketball beat and that’s a good thing – he’s one of ESPN’s better writers). Andrei Kirilenko (Utah Jazz) led Russia with 18. Carmelo Anthony added 17 and D-Wade 16 off the bench for the US. Kobe gave himself a new nickname after the Lithuania blowout: The Doberman. This has something to do with defense and Kobe priding himself on being able to shut down the other team’s best player. Apparently that didn’t apply to Ray Allen, who carved Kobe’s Lakers up during the NBA Finals. US coach Mike Krzyzewski locked Detroit’s Tayshaun Prince on Kirilenko in the first half. Jason Kidd was benched in the 2nd half in favor of Chris Paul and Deron Williams, and that may be a sign of things to come, Sheridan wrote. Or it could just be Sheridan picking up bad ESPN habits for manufacturing controversy. Obviously, Paul is going to get some minutes with Kobe and the starters and it’s really not a big deal for him to playing instead of Kidd. The bigger controversy is Kidd starting over CP3 to begin with. Most basketball fans around the world haven’t seen the spectacular point guard who finished 2nd in the MVP voting play all that much, and the Olympics are a made-to-order stage for CP3’s arrival. Something tells me, however, that Coach K would like to think he’s immune to these sorts of pressures. We’ll see. Another story building seems to be Coach K’s growing frustration with center Dwight Howard. He played Howard just 17 minutes against Russia and singled out forward-center Chris Bosh for praise after the game. Bosh isn’t a center at all, of course, and therein lies Howard’s problem so far in these warm-up games: The US has yet to play a team with a decent center. Howard’s likely bored. But he’ll see Bogut Tuesday and Yao Ming Sunday in Team USA’s first Olympic game. Those two ought to wake him up and give him some company in the paint. Spain’s Pau Gasol (Lakers) is still recovering from numerous injuries suffered against the Celtics in the NBA Finals, mostly relating to his pride. 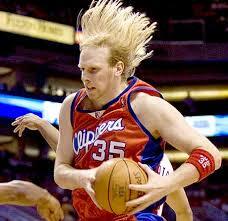 That leaves Germany’s Chris Kaman (Clippers) as the only healthy “true” NBA center in the Olympics. Or doing the new ‘do for Deutschland. This entry was posted in International & Olymp. and tagged 2008 Olympics, Andrew Bogut, Basketball Australia, Chris Kaman, Jason Kidd, Kobe Bryant, Team USA, Tyson Chandler, Yao Ming on August 4, 2008 by J.D. Mo. Because the Journal Sentinel hasn’t come through with much Andrew Bogut in China coverage, you can always check here (and probably find it) at the Bob Boozer Jinx. With Bogut used sparingly due to what was described as a minor ankle injury, his Australia Boomers blew a 19-point 3rd Quarter lead and fell to Argentina in the finals of the Diamond Ball tournament in Nanjing, China. Argentina, the defending gold medalists, features the Spurs’ All-NBA guard Manu Ginobili, forward-center Luis Scola of the Rockets and Bulls forward Andres Nocioni. Sure enough, with Australia leading 54-35 early in the 3rd, Ginobili hit a three to close it to 16, and then the whistles started blowing. The Aussie were called for six fouls in three minutes, sending three of its starting five to the bench with foul trouble. Ginobili took over and suddenly the lead was nine and the crowd was going nuts. The fans, the refs, even the waterboys — Argentina has it all in international ball. Bogut’s ankle injury doesn’t sound serious, and he probably would’ve played more if it was an Olympic game. As it was, why give Argentina a free look at a full strength team with its center? Australia and Argentina are in Group A of the Olympic tournament, so they’ll meet again in group play. The clock was on valium! You can follow Bogut and Australia here at the Australia Basketball site. Team USA blew out Lithuania 120-84 on Friday, with Michael Redd scoring 16 and shooting 4-8 from behind the arc in 14 minutes. Redd, D-Wade, Kobe, Lebron and gang shot a barrage of threes over Lithuania’s zone, 23 in all, hitting 11. When Redd started dialing in, Lebron took to yelling “bang bang!” when it went up. Settle down Lebron, you know the trade to Cleveland can’t go down unless Bucks GM Hammond works something out with Anderson Varejao and his agent, Dan Fegan. … and you know what Fegan’s like. This entry was posted in International & Olymp. and tagged 2008 Olympics, Andrew Bogut, Basketball Australia, Manu Ginobili, Michael Redd, Team USA on August 2, 2008 by J.D. Mo. “Andrew Bogut nearly dragged Australia over the line single-handedly, but the Boomers still needed a last-second shot from CJ Bruton to overcome plucky Angola 81-78 in the FIBA Diamond Ball tournament in Nanjing, China. The Aussies are in trouble if Bogut had to become Hercules to beat Angola in an Olympic warm up game, but isn’t that Aussie sports writing great? Bogut finished a three-point play from the lane to tie the game at 78, then set the pick that freed the winning shot. The Aussies needed 12 points from Bogut in the 4th to catch Angola. Needless to say, the Aussie coach wasn’t too happy with everybody but Bogut (a feeling former Bucks coach Larry Krystkowiak knows well) though it should be pointed out that Angola is the African champion and one of 12 teams in the Olympic tournament in Beijing. In other words, the international refs will call a foul if a defender so much as breathes on Manu Ginobli. The Aussies play clutch and grab Detroit Pistons style D – quite a learning curve. The Aussies play Ginobli and Argentina in the Diamond Ball final early Friday AM. Lebron led Team USA to a 114-82 prelim win in Macao, China, against the Turkish team, which was playing without its best players – Hedo Turkoglu of the Orlando Magic and Jazz center Mehmet Okur. (The Turks didn’t qualify for the Olympics). But this only meant more shots for Bucks 2005 draft pick Ersan Ilyasova, still Milwaukee property in the NBA. Ersan scored 10 pts, grabbed 5 rebs and played an active game. With Ersan gunning six early points, the Turks led this one 27-24, but Lebron, Kobe and D-Wade put on a show the rest of the way. Chris Paul, Chris Bosh and Dwight Howard contributed heavily. Lebron led the way with 20 pts. ESPN has a handy blow-by-blow game summary. I hope they keep posting those during the Olympics. The Bucks’ Michael Redd had 4 points on a jumper and two free throws. Believe it or not, he only took two shots, missing his only three point attempt. Isn’t Redd supposed to be the designated shooter? Speaking of Michael Redd: who is this guy in the photo to the left? Does he play for the Bucks? And is that some sort of Jedi mind trick he’s aiming at the camera or is that his Kobe Bryant imitation? Given the uncoachability hijinx last season (after Kobe and Michael hung out during summer international ball) I don’t think the Kobester is a very good influence on Redd. Apparently this is the serious Michael Redd. Or is this ladies man Michael Redd? He might possibly be mugging his on court tunnel vision. Whatever it is, it’s making me uncomfortable. The photo was gripped from Dimemag.com. I now must defer further questions about the state of Michael Redd’s mind to them. Btw, brawler Ron Artest has been traded to the Houston Rockets for back up guard Bobby Jackson, rookie forward Donte Green (who worked out for the Bucks before the draft) and a first round draft pick. Yao Ming reacted by saying he likes Artest now because he “hated playing against him.” Yao also hoped Artest wasn’t still fighting and going into the stands, but I doubt he meant it in a mean way. ESPN’s trying to play Yao’s comments into a mini-controversy. It’s not working. This entry was posted in International & Olymp. and tagged 2008 Olympics, Andrew Bogut, Australia Boomers, Basketball Australia, Ersan Ilyasova, Michael Redd on July 31, 2008 by J.D. Mo. “In a heated match marred by the occasional scuffle and some bruising screens, the Boomers prevailed by 12 points in a preview of what they can expect in Beijing next month. Yao shaded [transliation: slightly outplayed] Australia’s Andrew Bogut in the battle of NBA big men, but the visitors showed enough composure down the stretch to get off to the best possible start in the six-nation tournament and disappoint a vocal home crowd. Plus two blocks and an “unsportsmanlike foul” wrapping up Yao, which is what the above photo is all about. In its game report, Dimemag.com compared the Aussies to the 1980’s Pistons. Two unsportsmanlike fouls were called on the Boomers before it was done. China committed 23 turnovers and let the Aussie’s rough play “get into their heads,” wrote Dimemag’s Andrew Katz. In case you were wondering, former Buck Yi Jianlian was 0-3 from the floor and did not score. Yi added 4 rebs in 24 mins. “A loss like this doesn’t do much to dispel the looming ‘soft’ label pinned to both Yao’s and Yi’s chests,” wagged Katz. Next up for the Aussies (oops, after this warm up tournament) is a prelim Aug. 5 against Lebron, Kobe, Michael Redd and Team USA, which plays tomorrow morning against Turkey and Ersan Ilyasova – still the NBA property of the Milwaukee Bucks. After playing in 66 games for the Bucks during the forgettable 2006-07 season (sorry about that), Ilyasova jumped to the Spanish League’s AXA FC Barcelona for last season. He hasn’t missed much in Milwaukee. This entry was posted in International & Olymp. and tagged 2008 Olympics, Andrew Bogut, Australia Boomers, Basketball Australia, Ersan Ilyasova, Yao Ming, Yi Jianlian on July 30, 2008 by J.D. Mo.